Our small canvas prints are super cute and make an attractive gift set for loved ones and wall art for your own home. Choose three special photos or unique designs for each mini canvas panel and watch your design come to life in our preview system. Choose from three size options with rectangle or square shaped panels. These three part sets are a great way to capture your treasured memories. Square: 10 x 10" or 8 x 8"
The cute, compact size means finding somewhere to stylishly hang them will be a doddle. Choose landscape or square canvas prints in one of three size options, and select three special photos to print and display with pride of place in any room. There’s always space for mini photo prints in any home, so design a small canvas art set for your best friend showing the journey of your friendship. These three part sets also make a thoughtful first anniversary gift for your wife as an alternative to the traditional paper or cotton gift. Go mad for mini canvas art with our 3 for 2 offer. Design your first set, add it to the basket, go back to design your second and repeat until you’ve got three canvas print sets in your basket! You'll automatically get the cheapest set for free. Your small canvas print sets are handmade to order. Our specialist printing process locks in the colour giving your photo gift a long life. The printed canvas is hand-stretched over FSC certified wooden frames, creating a durable and sturdy finish which arrives ready to hang. When uploading your chosen image, ensure that the entire print area is covered with the background of your image. The red lines shown in the design interface are where your canvas will be wrapped around the frame. The gallery wrap style means your design continues onto the sides of the canvas so this needs to be filled. You can also add a background colour, this prevents your canvas from being printed with unwanted white lines. 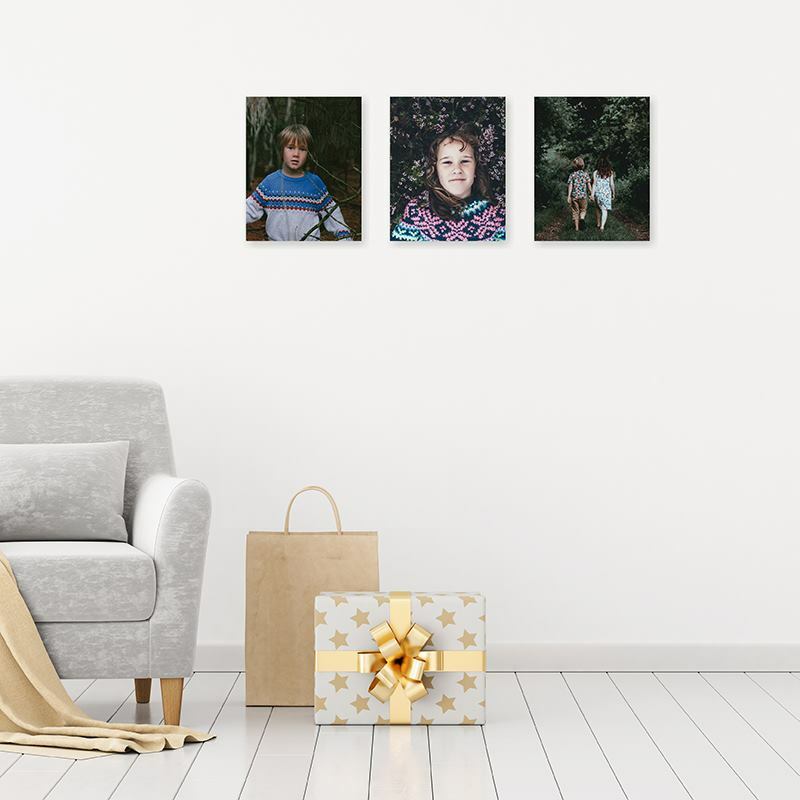 When you select your photos, check to see whether they’re portrait or landscape so you can choose the canvas dimensions that will best showcase your prints. To give a stylish and professional look to your canvases, we wrap your image around the sides. This means that the edges of your photo won’t appear on the front, so keep all important features or text inside the red dotted square when you’re designing. Three part photo prints enable you to tell a story through your own snaps. Photos from the same scene, but taken at different angles, such as being carried out of the church on your wedding day, looks great when displayed in succession. The emotion really comes through and brings still images to life. Give each canvas panel its own individual look by changing the filters in our design tool. Leave one print in full colour, but edit the other two to black and white, and sepia. When hung in a diagonal line or random cluster, this quirky design will look striking.